As we get ready to celebrate our freedom and independence here in America on the 4th of July, here’s a salute from Highland Woodworking to the brave men and women in our Armed Forces who are serving our country while deployed in Afghanistan, Iraq and elsewhere. 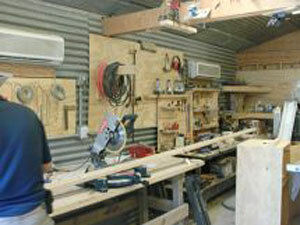 A recent letter from Army soldier Roscoe (Randy) Harris included a few photos of the woodworking shop that he and fellow soldiers have built on their base in Kandahar, Afghanistan. It’s not beautiful, fancy, or by any means a work of art, but this little old woodshop means so much to a great bunch of soldiers who come here to take their minds off the fact that we’re in Afghanistan. This is our home away from home. The shop is located on Kandahar Airfield in the Kandahar province of Afghanistan. Downtime is what makes it so hard being here, and what better way to take your mind off being away from your family than doing something you really enjoy doing. I am very grateful being a part of this wonderful place and helping set it up and keeping it up. We have spent countless hours here building extra shelves, bunk beds, and many other items to make life easier here for soldiers. READERS: You can log to the comments section below to pass along your 4th of July wishes and thanks to the guys at the Kandahar Airfield woodshop. Guys, your “little workshop” is awesome.. I am so proud that you have it as a place of reflection, and place to be creating, and a place however small it may..that reminds you to stay safe, get the job done..and get the hell home! I can never appreciate, nor thank you all enough for what you do on a daily basis. I love you all. My dad, a master shipbuilder for the U.S. Navy during World War II and Korea, would have called shops like that–pieces of heaven. Amen to that! I cannot thank you enough, either as a fellow woodworker or an American or Virginian, for your work there. But thank you for protecting us, and giving others the taste of freedom. On July 4, I’ll raise my cup of Joe in honor of you, and all those that have served in the name of liberty! It’s great to see the creative spirit alive and well during these challenging times. Work safe and keep it up! Just wanted to say a heart-felt thank you too all of you serving in the armed forces over there. My son is a Sgt. in the army in Iraq, and we as a family and a nation salute your efforts to keep the US free and safe! That is one of the best ideas I’ve ever seen. I know when I’m in the shop the rest of the world fades away very nicely. Do they need any tools? You guys and ladies are great! I appreciate so much what you do for our country and never take any of you for granted. You deserve all of our respect and and a huge vote of thanks. I’m happy that you have a work shop and some tools to keep your mind off of the war occasionally. Keep on building! You all are to be honored for what you do and what you risk. We are all so proud of you. It is wonderful that you have this workshop in which you can spend some quiet time and create from your minds beauty with your hands. Looks like a great shop to me. Thank you so very much for your service to our country. I pray for you guys every day and really appreciate that you are risking your life for me and all Americans who are not in harms way. Please be as careful as you can and God Bless all of you. Tony wants to know – is it difficult for you to get lumber for your shop? And what kinds of woods are available? Not only are we most appreciative of you and your shop (Tony is a woodworker) we are the parents of a National Guard lieutenant who will be deploying later this year for parts yet unknown in Afghanistan. We are so impressed with the wonderful eagle woodcarving and the shop itself. We understand the comfort that working in the shop gives all of you. The value of your time and efforts are immeasurable. Thank you for your service and we hope you are sent home soon. Dear Randy (and fellow woodworkers), your letter and pics brought back many fond memories of productive “down-time” activities we manufactured as soldiers and airmen in Viet Nam (’68-’69). That is only one example of the inguinuity and creativity of the best American Ambasadors in the world. Know that you are in our prayers daily, and that you are held in high esteem by your fellow Americans here at home. You represent the “best of us” and we are so proud of your service, and anticipate your return to us. Hope you have some time to reflect on what’s important on the 4th of July! Hey! That’s pretty COOL shop y’all have there! Considering the circumstances! It’s nice to see that y’all can be able to things with wood… get tools, etc., etc. How do you get the wood to play with? Pallets? Do you have good wood glue to use? Possible for us to send y’all some stuff? If so, tell us how. Thank you for coming home safe & sound! its great to see you have a little wood shop to go and take your mind off things for awhile and thanks to every one of you for what your doing so i can go out to my little shop and do the same. may God go with each and every one of you and when your job is done he brings you home safe! Woodworking is a great way to relax so you can stay sharp when it counts. It must be great to be able to create something in that environment. I’m sure there are lots of down days. Keep safe and keep your head on a swivel. Your efforts and commitment are very heartfelt and much thanks & many prayers go out to all of you. Back in 1967 I took refuge in a completely equipped photo lab on our little base in Maine. I was the only guy in it and It was wonderful. I only have two questions, where do you get the wood and what kind is it?? developing film (now that is some old school stuff) and then making a shelf units for several guys. The down time with a place for my mind to create was absolutely great. I and 50 or so men are on our knees at the alter of our church every Sunday praying for you, your fellow soldiers and our leaders. MAY GOD BLESS US ALL!! Its great to see your shop and your obvious dedication to both country and its hisAorical traditions. Being engaged to this hobby will keep your mind active, your senses keen, and provide influence to your brothers in arms. Keep up the good work. I, and I’m sure other woodworkers, look forward to seeing your projects and can only hope that you and your fellow woodworkers can bring them home for display! I’m proud of you and your fellow soldiers. Keep up the good work. My prayers will be with you all. Thanks for all you and your buddies do to keep our country and families safe. All of you are heros in my mind. I pray for you and your families. May God bless you as you bless America with freedom. I can’t begin to express my feelings seeing that woodshop. It is more than impressive; it’s just awesome. We pray that these woodworkers get home safely. Great shop, guys. It must have taken a fair amount of ingenuity to put it all together. A question – In every news photo I have seen from Afghanistan, there have not been many trees. What do you use for material? All of you over there have my unending respect and gratitude. Thanks for the pictures and info about your shop. It looks great to me. I have been a woodworker since I was a child and I am now 73. We designed and built our home when I retired a few years ago and the design included a nice woodshop. I enjoy being in my shop as much as I can. I can forget the world around me for awhile. I am sure your shop allows you to do the same. Keep up the good work in the shop and on the job. We are proud of you and hope this war can end soon so you guys and gals can come home to your own pashion. We put up our flag most days but on the 4th we put up a very large flag, just for you guys and our great country. I understand your comment on downtime – it can get rough – the shop is a great place to escape back home if but for a few moments Let offer my congratulations on your shop and to thank you for your service. I offer my prayers for you and your family and your safe return home. 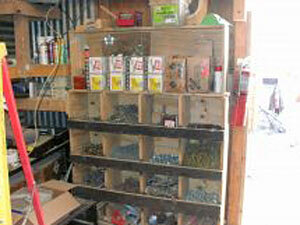 Additionally, I was wondering if there are any tools or supplies that could be sent to help in equip the shop. Please let me know “what” and “how to get it to you” and I’ll get to work on it. Best to you and fellow woodworking soldiers. PS. A big THANKS to Highland Woodworking for supporting our troops. Thank you for serving our country with pride. I am glad you have a woodshop to help take your mind off of your situation. and we will get to have all of you back home with us. I pray for your safety and well being. more time in. Thank you for all you are contributing to the safety and well being of our USA. May God bless you and your families daily. You are greatly appreciated. Thanks for your service may you return home safe when your tour is complete. We appreciate the sacrifice you and your family are making in our behalf. I’m glad you have a place to do a little woodworking. I know for me my shop is my sanity check sometime from my work. I can’t begin to imagine how much your shop must mean to you. Please let us know if there is anything we can do to help with your shop and you being able to have things to work in it. May God bless each of you. As strange as this might sound, seeing this shop really touched me and brought the war home to me in a way that the news stories just have not. I thank you all for your service and wish you all possible success at whatever you may work on. Your shop is awesome. Keep the good work and be safe. God bless you all. God Bless all of you for the fine job that you are doing! Your shop looks great! That was a fantastic idea! My shop keeps me sane…I am sure that it helps do the same for you. You guys are awesome and words can not convey how much we appreciate what you are doing and the sacrifices you are making for us, our kids, and our country. I hope you can find a few hours of peace and enjoyment in your new shop. Stand proud and always remember that we are with you in spirit and hope you finish your mission and return home quickly to your loved ones. i think it is great that yall have a wood shop there.i think it even greater that yall are defending our country thank you a lot and god bless you all. God bless you guys and thankyou for your service to our country. be safe. That is a pretty cool work shop. I hope you all make home safely. My thanks goes out to all of you. May god be with you. Fantastic. Good to see you guys & gals have a great place to wind down. What are the woods you’ve been working with? Local woods must be less available than “imported” pallet wood. Would love to see some of your creations. Thanks for all you do! As retired military and fellow woodworker i can atttest to the therapy making something with your hands provides. I wish to provide my profound thanks and appreciation for what you folks are doing in Afganistan. I am glad you guys can get some wood time in over there. I been doing this woodworking thing a long time. If I can be of any help, drop me a line. Good luck to all you all. Thank you for your service. If not for you men and women and all who proceeded you I would not be able to enjoy my woodworking pursuits in peace and safety. Best wishes from myself, my wife, 2 children and 4 grand children. Stay safe and Godspeed. What a great way to spend your down time.It looks like agreat place for wood working.I am so proud of you all who have voluntered for this service to america.Keep up the great work.I am an eight veteran of the us navy and a woodworker.I salute all of you. Dear Randy……CONGRATULATIONS on setting up a shop in Afghanistan! I can’t even clear out a space in my garage! I am a student in the woodworking program at Cerritos College in Southern California, and I’m probably old enough to be your mother but I just took up woodworking about 4 years ago because it was something I always wanted to try and I was just getting older, so if not now then when? What I thought was going to be a hobby has turned into a passion. By trade I’m a writer but I find that the two endeavors are very complementary. Like you, what I enjoy most about woodworking is making things for other people. 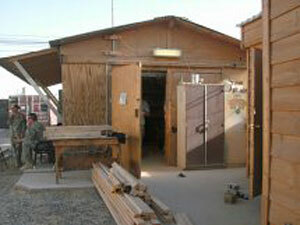 THANK GOD there’s a woodshop in Afghanistan for our military! I salute you for making it happen! HOWEVER, when I say BE SAFE, I mean not only in your military actions, but also around that table saw! Thank you all for your blessings and support. I am happy to say that I am already back home. I sent Highland these pictures about a month before my 12 month tour was up. I was told just now that the shop moved to the other side of the airfield along with the Brigade that took over our spot. Not sure if it is back open yet but I am sure they will open it back up. Wood- We had a few different ways to get wood. We would collect scraps from other construction sites which was the best way. There was a woodshop on KAF that was run by NATO and they had a scrap wood bin. We would sand down pallets if it was pine but spruce ones were ok too. My carving wood came from a local wood dealer who sent me 4 boxes full of basswood. Very very kind of them. I also had a few carving templates supplied by fellow carvers. We found about 60 or more board feet of purpleheart wood behind one of the buildings. It was supposed to be for a chapel but it was never built. We used it to make awards and stuff like that. Trees- We where very close to the red desert so we only had a few trees on the base. You could see some trees outside the fence line. Not enough to get excited about. I didn’t see one blade of grass until I went home for R and R. It only rained about 5 or so days the entire time I was there. Pens- yes, i just started doing pens before I deployed. We have a woodshop here on post that has 6 mini lathes. We also have a lot of bowl turners here. The woodshop also has classes on doing them. If I missed any questions or if anyone has any more, please feel free to ask them. Highland wants me to do another newsletter article and I will have a bunch of photos of the people, things we built, and will show all of you what we do here back at Fort Campbell. Thank you all for the support and for wanting to donate to our little shop. I really loved that shop, but not enough to stay in Kandahar. The next goal I have lined up is getting someone to do a chair or table class at the woodshop on post. It would be great to add a few more members to the woodworking family! I think it is wonderful that you have this workshop. I am a retired contractor and I have a cabinet shop while we were in the building business. Love my shop, at my home and am finally having time to work on thing for my wife and myself. Enjoy the woodworking and be safe. I wish I could pray all of you home, but that is not going to happen soon. We all love you and what you are dong for our nation. I figure that you guys have heard of the book, A Cabinetmakers Notebook, but if not check it out. If you don’t have a copy of it and I would like one I would be be happy to send you one. Randy, thanks to you, and all of you. May God bless you, and return you safely, soon, to your family. And may you enjoy that shop a lot until your return. Thank you for your Service, and good to see that you have some time to “get away” if not in a physical sense, but at least for the time you spend working on your projects. God Bless and stay safe. 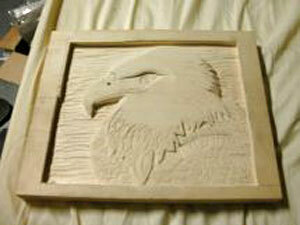 Beautiful carving of the eagle. Great workshop. Thank you for serving our country! Randy, my gratitude for the service you have provided to all of your countrymen and women. My small part is to continue to pray for you and your comrades safe keeping. Another thing I could maybe help with is your interest in a chair class. I make Windsor chairs and wonder if you would have time, space, and interest in a me and a couple my chair making friends doing a chair class at your base? Welcome home and thank you for serving. God bless all who keep our country safe and God Bless America. I hope the guys have the wood working shop up and running again. If I had an address I would send some wood carving blanks and instructions. I have Basswood also Tupelo Gum if there are power carving tools available. My husband and I went there for years, learned so much, met so many wonderful people and had a terrific time. The price is $330 per person or $640 a couple. You stay in the dorms and eat in the cafeteria. The only other cost is the material you use such as the carving blank and what you want to spend at the vendors. That’s my down fall. I turn pens, too. I make my blanks and have and assortment of different types of wood. I would be happy to send you some if I had an address. Randy, you make me proud to be an American! So glad that you are home safely, and I wish the same for every other American soldier over there. 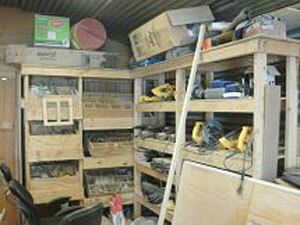 Love the wood shop, and I bet you have inspired many other soldiers to become interested in woodworking. Congratulations on a job well done!!!!! Thank you for all your efforts, may God Bless you all while you are away from home. Our Nation is very thankfull for your service. Great looking shop…would love to see more pictures of your projects. Thanks for all you’re doing. We look forward to all of you returning soon. First of all, thank you for all you do. I love your shop. It’s great you get do to some wood working in the middle of the chaos. Do they have any interesting wood over there? Be safe there and come home soon. Randy, that is a fine looking shop you guys have there – glad you have some kind of home away from home. Thanks to Highland for bringing this to our attention and thank you all for your service! Thank you for your service Randy and great job with the workshop. Thanks for sharing your story and pictures. I think it’s great that you guys had the initiative to build and maintain this wood shop! We here at home really appreciate all that you and your fellow soldiers do and we support you all 100 %. I’m glad that you have this shop to help you get away from the pressures of your jobs. God Bless you all and take care! That is a wonderful shop! The smell of the sawdust is a good thing to start a project and feel closer to home. The Eagle relief is beautiful! It is a reminder of all of you guys who are in country doing a great job for our country. My prayers are with all of you that you stay safe and that this war is over and you come home soon. God bless you guys and keep enjoying that shop. It looks surprisingly like mine only yours is bigger ! Ha Ha! Thank you and the other men and women serving with you for protecting our freedom. Wow! First off…God bless America and you, the strong and the brave. Do not think that we take your service for granted, we are tremendously grateful. Man, that’s a sweet shop! When can we hear more about coolest projects, etc.? Can you keep the air flowing inside? Thank you so much for your sacrifice. Please stay safe and God bless. hope that you guys are enjoying your workshop. Looks like you got a good deal going on. Keep up the good work and always remember that we really appreciate everything that you do. May God bless you all. May you all be safe, and come home. May the Love and Guidance of the Holy Spirirt be with you and guide you, May Jesus Christ protect you. Thank You for your service and come home safe. The Shop looks great, keep up the good work. What type of wood is indigenous to Afghanistan? I know some good friends here in the states that use woodworking to get away from the hassles of the workplace. It is a great way to relieve stress and enter into another world for a time. I am grateful that you and your fellow servicemen have access to a workshop. Thanks so much for your sacrifice and bravery in protecting our freedom. May God bless all of you. To all my fellow woodworkers currently deployed in far away places I’m truly glad to see that you now have a place to go and keep your mind off what is for you, The Daily Grind. Hope it gives you some great downtime and makes being there a little easier to deal with. First off I want to thank everyone of you for your sacrifice. I spent 22 years in the Air Force but you men and women are my heroes. Ya’ll are the reason that I can send this from work (don’t let that out) or sit in my workshop at home and enjoy life. God Bless you and may you return home very soon. Thanks for the pictures of your shop and projects. It’s great that ya’ll can get away from it all, even if only for a few minutes. Please post other projects when you get a chance or just an update on how things are going. Take care and be safe. Hey guys, I am so very happy that you were able to find a way to “Set Up Shop” while you are so very far from home!! I look forward to more of your reports, and hopefully, more pictures of your tools, materials and projects. Thank you for your service, we all depend on you so be safe an enjoy the hobby when you can. Best Regards from Morrison, Illinois!! You all are SO appreciated. Though I fear many States side folks allow you to drift from their minds at time I know you are so appreciated!! I am a retired school teacher who works at McDonald’s to supplement the income and I thank the men and women who come into the store who are wearing signs of military service. Often others make comments about how blessed we are to have you all serving on our behalf in an ugly situation. Thanks YOU! Each and every one. It is great to see you able to do some wood working to get your minds off life there. Thanks for your service. I am a long time woodworker and retired military. 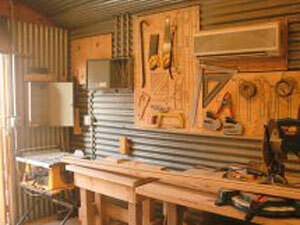 Having a wood shop to take your mind off of your tuff job and loneliness away from home. Thanks for your service. May God safely guide you and bring you home soon. Before I read your note, I never even considered your “downtime”. Now, I begin to think of your efforts in Afghanistan in a whole new light. You are real people, not just statistical soldiers. Thanks for enlightening me and for bringing me to a new appreciation of what y’all do for me. Guys, this is awesome! I would love to contribute something to the shop. Please e-mail and let me know what you guys need, or if a gift certificate would be better. Thanks for everything you do for the rest of us. You make me proud to be an American! Despite your being so far from home and being in a place where your life is on the line, you and your brothers and sisters in arms are making a huge difference in the lives of the people of Afghanistan. One thing that shines as a positive example of “Good Americans” is that despite your situation, you choose to spend your off-duty time in a creative and constructive endeavor. Not all people faced with a bad situation take such a high road. I’m glad to see you guys have something to take your minds off of the situation. Nothing like a little woodworking to make you feel at home. I am kinda curious as to where you get your wood. We’re all praying for you guys, and behind you 150%. You guys make all of us proud, proud of you and proud to be AMERICANS!!!!!!!!!! Awesome woodshop so far away from home! Our prayers for a safe return go out to all of you!!!!! Your workshop looks great. Mine is a mess most of the time. Do you want to make something or clean up? Do not get a chance to say thanks often enough for everything you do for our country and me personally. I am not a vet but of the vietnam era and you will not be treated like my friends when you get home. You represent our best a should be treated as such. Thank you very much. Nice job on the eagle, ………we all sure appreciate the job you guys are doing over there for us. Awesome little woodshop guys! Keep up the hard work and keep up the spirits. Happy 4th of July!! First thing is first Thant to all of our service members for such a fine job you all are doing and i am glad you have a taste of home there. From a fellow woodworker and fellow American this is awesome that you are able to have this shop to enjoy, but more than that, thank you and all of our soldiers for the great sacrifices you make every day for our freedom, freedom is not free, Thank you and I pray for our soldiers on a regular basis, may God be with all of you. Glad to hear that you put the shop together. looks great. Want to thank all of you for being there. Wow. Nice shop. You should see my 16*16 bldg, I was always told if it isn”t a mess then you arn’t doing anything. Would love to see more of the work that comes out of there. Thank you men and wemon for the service you are doing for the USA. Take care of yourselves and come home, also; keep the wood chips flying. This is very nice work and well put together. This is what we call being creative using our minds in good fashion. Also, thank you all for you serve to our country and all that all of you have done from the beginning. As a viet nam vet myself, i can understand how much the shop means to you. All you can do is keep up the good work there and we will keep you in our prayers here.GOD be with you all. HEY GUYS, THANKS FOR WHAT YOU ARE DOING OVER SEAS.THE SHOP LOOKS GREAT.IT LOOKS OLDSCHOOL AND THAT IS A GREAT LOOK. Glad to see that there’s something over there for you to enjoy. Thanks for what you do. God bless! The woodshop looks like fun. My husband is a woodworker and frequently destresses in his own shop. The 2 of us have 48 years in the army and certainly appreciate what you are doing for all of us here in the states. Thank you for taking up the task we have both laid down for others. God speed and stay low. We want all of you home safe and sound. We want to take up a collection and send you a vintage American Radial Arm Saw for your shop. Very proud of you all. Please be careful. hey guys!!! GREAT SHOP!!! keep the woodchips flying and your heads down low!! be safe and get home to your families soon. Great shop! Thank you for your service and keep safe. You must be Army Engineers. Are you letting any others over here on KAF come over and unwind in the shop? I’m out here till the end of Sept and just saw your shop on Wood Jocks. Just saw the pictures of your woodshop on the Highland Tools website. That’s great that you guys and gals set up the shop. Hope you keep posting more photos. Thanks to all of you for what your doing. God Bless and take care. My wife and I pray for all you folks over there. My daughter’s stationed at the airfield with the 63rd Expeditionary Signal Battalion – been there a little over two months. While I haven’t spoken to her since I saw this post I would bet that it’s something she would really love doing with you guys. I have no idea what the right protocols for this are and I’m probably just continuing with my over-involved parent thing but if you’re looking for others to join in just let me know and I’d be happy to let her know about your shop. She was a welder’s apprentice for a little while at a sign shop where she also worked as a rigger (she knows her knots – not much help for woodworking, though) so she’s someone who likes to work with her hands. Anyway, I figure it can’t hurt to ask. Thanks and good luck to you all. Denny is our project manager and does a fine job keeping up. I have been carving wood for almost 20 years. my web is http://www.sherrylouart.com Thanks again, Your shop looks great. What kinds of wood do you guys find over there? Ive been a carpenter for 20+ yrs and I know that working with wood and creating something with your hands is some of the best therapy you can get.Thanks for your service and I pray you and all your fellow warriors get back home,Gods speed. Woodworking to the brave men and women in our Armed Forces who are serving our country while deployed in Afghanistan, Iraq and elsewhere.